Paul Maurer loves percussion, and goes to great lengths to design just the right sounds. Whether it's an acoustic sample, signal processing in Max, or a toy being struck against a desk, Paul has made a name for himself and his company, Uppercussion, as a purveyor of first-class drum sounds. We're pleased to include one Pack from Uppercussion, Digicussion 1, in Live 9 Intro, while Digicussion 2 and Bomblastic are also included in Live 9 Standard and Live 9 Suite. How were the sounds of Digicussion created? The Digicussion series sounds come from a combination of sound synthesis in Max/MSP, field recordings and the occasional studio session. The sounds are typically layered, processed (often at several stages), edited (also often at several stages), and finally mastered before becoming part of the kits. The sounds that are synthesized in Max/MSP start out quite basic actually. In a typical Max patch, there is usually a part that generates an attack transient using various types of noise and another part that generates the body resonance using mostly wavetable synthesis. Standard attributes such as pitch & pitch bend, volume envelope, timing etc. are entered, but then the sounds will typically go through other effect patches made in Max such as various filters, overdrive, bit crushing, and other "mangling" effects. Once these samples are created, then they are usually layered either with other samples created in the same way, or, more often, with other samples from field or studio recordings. Just as an example of how I might put a sound together, I would take the attack sound of a snare rimshot, add the resonance of a conga, and combine them with the ambience of a door slamming in a parking garage. Then I would adjust the pitches to match each other, crossfade them a bit to give it a uniform sound and layer it with a sound synthesized in Max/MSP. I process the sounds at various creation stages, add a touch of mastering at the end and then finally have a finished sample. What's the difference between Digicussion 1 and Digicussion 2? As the name says, Digicussion 2 is the second part of the "Digicussion" line, so in that respect the kits and sounds have a similar concept as in Digicussion 1. However in Digicussion 2, the kits are a bit more homogeneous than in Digicussion 1 with more thought to the complete picture of the kits before creating them. To put it another way, Digicussion 1 was more going from samples to the kit, and Digicussion 2 was more the reverse, going from the kit to the samples. Looking at Bomblastic, you’ve divided the sounds into three categories – "Acoustified," "Electrified", and "Kindified." what kinds of music were you thinking of when you created this Pack? The Bomblastic pack was created with hip hop in mind, but adding more variety and putting a twist on some of the sounds. The Acoustified and Electrified kits represent the two main types of sounds heard in hip hop, i.e. acoustic and electronic based drums. The Kindified kits go for a unique approach with sounds that are not typical for hip hop, but still fit well with that genre and related genres, offering something new. But the sounds in all of the kits go away from standard drum machine samples or break beats. The kits in Bomblastic sound like a mix of live recorded drums and synthesis. How did you record and process these drums? The Bomblastic samples had a similar creation process to the Digicussion samples, but there was more focus on the hip hop genre and less of a "synthetic drum" approach. The samples were also a bit more "direct", not doing too much layering or experimental processing, but rather focusing more on specific drum types. Are there any unusual sound design secrets you wouldn't mind sharing? Any time I go somewhere new I usually take my field recorder with me. There is always something that resonates well, or there is a room with a nice ambience, or something that generates a unique noise, or even a group of people willing to get together for some timed clap recordings. Sometimes I get a sample from a spectacular place, but the sample itself is unspectacularly hitting a nice metal pole that happened to be there. 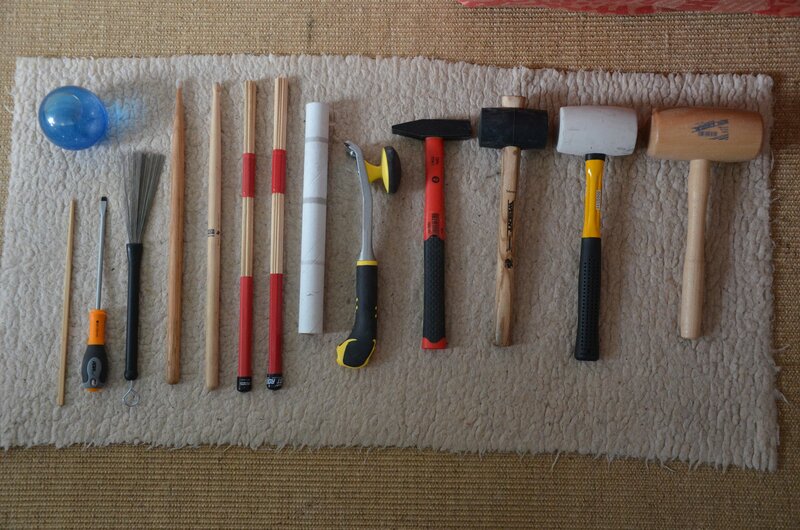 I have a collection of "striking tools" that I use when gathering field recording sounds. I try to get tools with a variety of different striking surfaces and materials, and I'm always changing the collection. 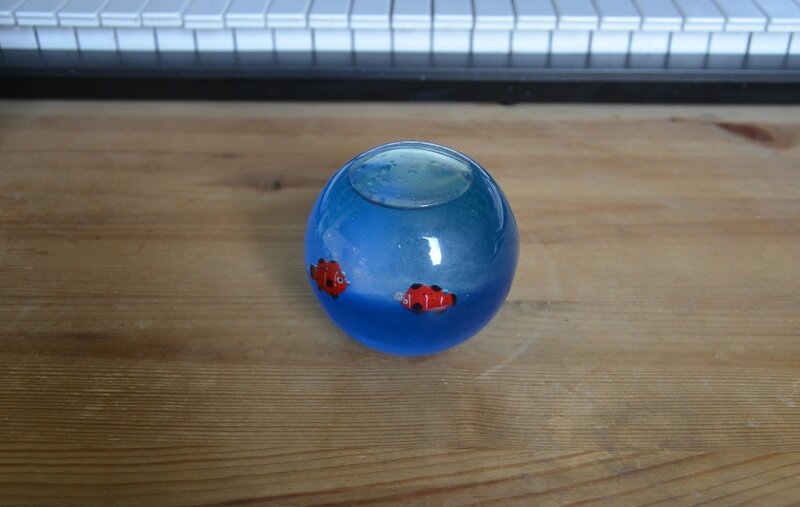 One of my favorite tools is what I call my "kick drum ball" that I found in a toy shop in Potsdam. Just about every surface I hit with that ball sounds like a kick drum of some kind. The ball is made of a soft plastic that when hitting a surface is similar to the sound of a rubber kick beater on a bass drum head, and its density and buoyancy really give most surfaces a lot of "punch". The trick is always figuring out how to hit the surfaces so that there is enough time between when the ball strikes and when it lands or is caught again. Usually this just means throwing it very hard. I have come to appreciate the inspiration that the limitations of a small sample set can bring. A 16-sample drum kit with the essential components can sort of force the mind to take what is there and find new ways to use it, which often leads to new ways of thinking about beat composition.